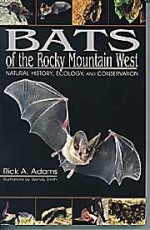 The behavior and ecology of the 31 species of bats found in the interior western United States. Based on nearly two decades of field work. Beautifully illustrated 2003, 289 pp., SB. By Rick Adams, with illustrations by Wendy Smith.